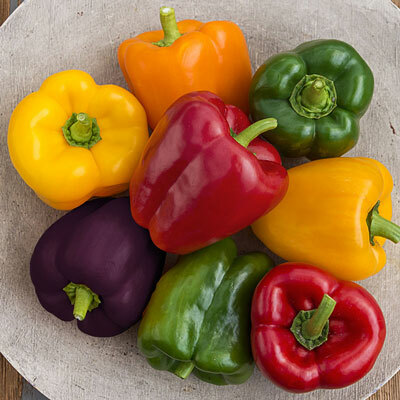 Sweet Bell Pepper Hybrid Mix | Henry Field's Seed & Nursery Co.
A sampler of multicolored green, yellow-gold, red, purple and orange bells. 65-80 DAYS. Height 18 - 36 inches. Height: 18 - 36 inches. Depth: Seeds 1/2 inch. Plants at the same depth as in the pot. Days To Maturity: 65 - 80 days from transplant. Soil Requirements: Rich and well-drained soil. Fruit: Mix - various colors. Green, yellow-gold, red, purple and orange. Yield: 60 lbs. per 100 foot row.